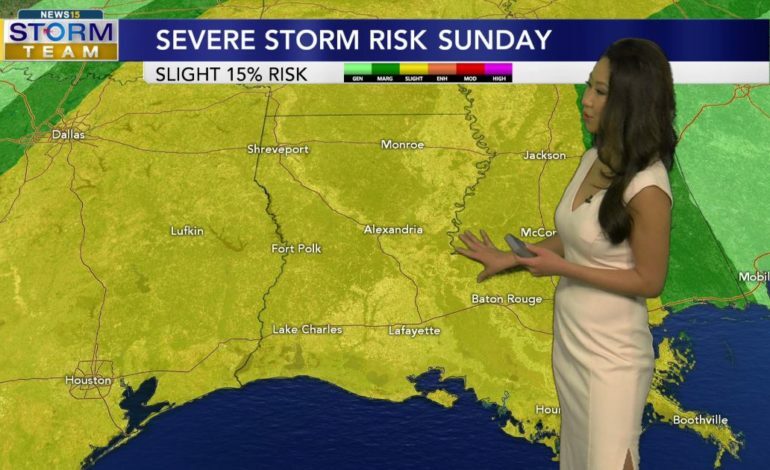 Stay weather aware on Sunday as strong to severe storms are possible across Acadiana. The first half of Sunday looks to be mostly dry and cloudy. It will be warm and muggy, with high temperatures in the upper 70s, making the atmosphere unstable and ripe for severe storms. The entire state will be under a SLIGHT RISK for severe weather on Sunday. The timing of the storms will be between noon and midnight with the highest likelihood for severe storms will be during the afternoon and evening. All modes of severe weather is possible: damaging wind gusts, isolated tornado, heavy rain which can lead to flooding, and hail. – If a WARNING is issued: TAKE ACTION. Severe weather is occurring or imminent. Go to your safe place and wait for the storm to pass. Conditions will improve through the overnight hours on Monday and the severe risk will be downgraded to MARGINAL, which is the lowest threat level. We’ll continue to dry out during the day and night Monday and drier conditions and sunshine returns Tuesday. Warm and sunny conditions will carry into Wednesday before another front approaches the area increasing our rain chances late in the week and next weekend.